I love the line of body moisturizers from Dr. Hauschka though they are a little pricey. The glass bottle is a reassurance of quality, the smell is completely natural & works for me as I react to synthetic scents. The moisturizer works well though a little sticky. This is a lovely product that absorbs very well and provides long lasting protection, even for my hands! Other creams often just sit on the surface, but this one really seems to penetrate. Not my favorite scent but still nice. That's why I gave four instead of five stars. Leaves my skin feeling soft and is easy to use in the shower after washing; quicker than applying lotion or oil after showering. One of my top five Dr. Hauschka products. Absolutely lovely, silky texture, not too heavy, perfect for Summer and when you just need a drop of moisture. Did I mention that it also smells awesome?!?? What I like about this cream is the clay that is in it. It absorbs the moisture and keeps it in, preventing it from evaporating, so that my skin is covered with this blanket of clay moisture for a long period of time. It is always good to switch from cream to cream, and this cream is a great one. Plus, the aroma is so pleasant! I like and recommend this product. While my skin is damp, I smooth it on with a couple of swipes and it disappears. After a few seconds it absorbs completely. My leg and arm skin feel moist but not oily in any way. A bottle lasts me a long time because it spreads thinly and only a little is needed to be effective. It keeps my skin from drying out between showers. Keeps the skin hydrated. Feels wonderful and soft. Formula change for the worst. This was my favorite body milk for over 20 years, and I was so disappointed when I received my latest bottle to see that it is thinner and less creamy. What a disappointment! I will have to find a new body milk. It was perfect the way it was before, and this reformulation is a fail. Hi Nina. I'm sorry to hear you're dissatisfied with this moisturizer. The formulation hasn't changed in over eight years, so is it possible you're mixing this up with another one of our moisturizers that has a thicker consistency? You can certainly return the product if it's not to your liking. 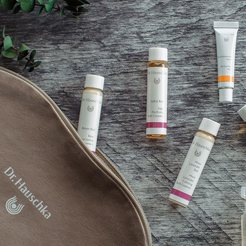 Here's a link to our return policy with the address: https://www.dr.hauschka.com/en_US/customer-service/return-policy/. You can also reach us at 1-800-247-9907 between 10am-3pm Monday-Friday. I have extremely acne prone skin, and have never had good success with moisturizer. This was the best I have ever tried. My skin is clearing up and is always hydrated. Very light texture and pleasant natural smell. Small amount applied all over the body really softened my postpartum body from day one. To seal moisture into your skin, apply a body oil over the moisturizer, such as Birch Arnica Energizing Body Oil, Blackthorn Toning Body Oil or Lemon Lemongrass Vitalizing Body Oil.